The pier in Yokohama Harbor, Kanagawa Prefecture. 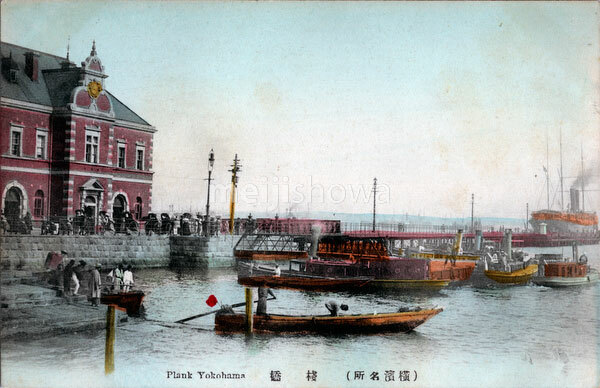 Construction of the 19 m wide by 730 m long pier was started in 1889 (Meiji 22) and completed in 1894 (Meiji 27). The red brick building on the left housed the Yokohama Customs Office Inspection Bureau (税関監視課庁舎) and was completed in the same year as the pier. It was designed by Yorinaka Tsumaki (妻木頼黄, 1859-1916). The iron pier was designed by British Army Engineer Henry Spencer Palmer (1838-1893), and built by Zentaro Mita (三田善太郎, 1855-?? ).